Culinary Fool | Creating at home. Eating out. Wine tasting. 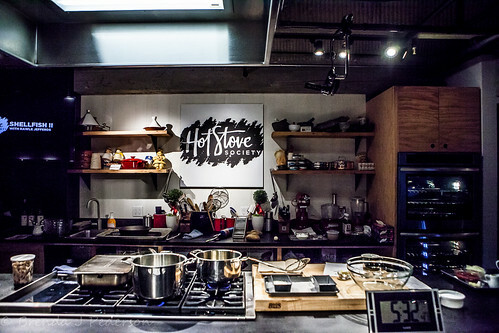 Culinary adventures in Seattle and around the world. Stopped by the new Starbucks Reserve Roastery and Tasting Room on Capitol Hill this weekend. It’s a gorgeous showcase with tubes and copper and controls all over the place. 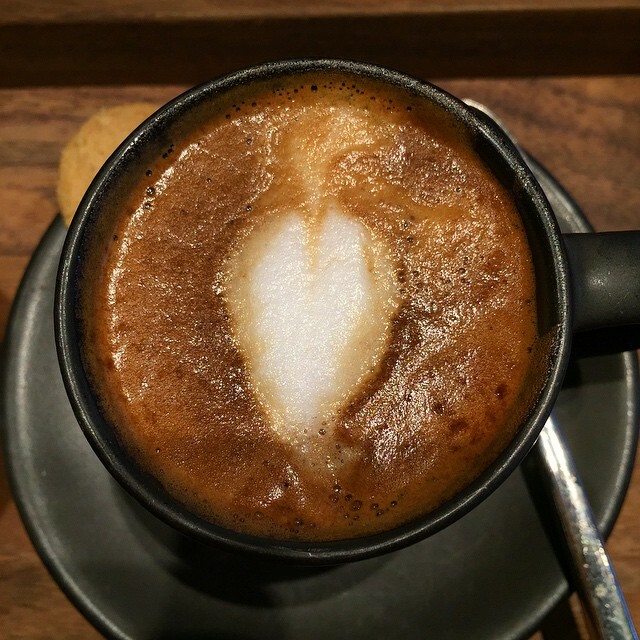 They are taking coffee back to the more traditional Italian offerings, which is nice to see. I like that “to go” is an option, not the expectation, which means everything is served in beautiful cups. The Reserve coffees are good. But the place is noisy; quieter in the lower area, especially in the little library, but overall unpleasantly noisy. Sitting at the bar was nice. Except that the bar has a large slanted edge which forces you into bad posture. For that matter, the tables and chairs all looked rather uncomfortable. I guess it’s their interpretation of clean, Italian style. Except the Italians do it way better. There’s a Serious Pie there, too. Much quieter in that area! We didn’t eat but it’s the standard, delicious Serious Pie menu. Great place to stop in now and then, maybe bring Seattle visitors, not sure I’d make this a regular habit. We’re a short two weeks away from Taste Washington, the annual event showcasing Washington wines (this year there will be over 230 wineries at the Grand Tasting!) and Seattle area restaurants. It’s a really fun, interesting event and I highly recommend it – especially if you’ve never attended. 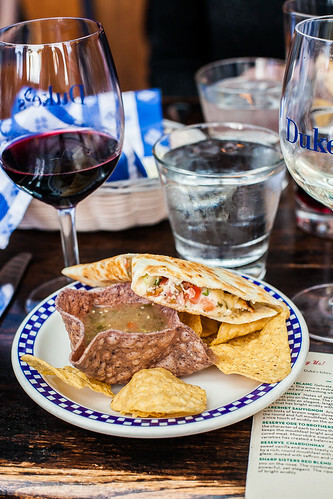 A couple of weeks ago I was invited to a wine and food tasting/pairing at Duke’s Chowder House. Remarkably, this will be the first year they take part in Taste Washington. They wanted to get their offering right so they brought in a small group to try several dishes they were considering for the event. For this tasting, Mercer Estate Wines poured several samples from their lineup to see how the food would work with various wines. This was a really fun, well-planned event. It was a seated tasting with two or three generous, food bites served for each “course”. Mercer Estates poured a red and white wine to accompany each course. I can honestly say I enjoyed every single bite and sip that night. The group unanimously chose the Lobster Mobster Pernod Chowder (recipe below) as the overwhelming favorite. Made with langostinos and a lobster base, it’s rich, creamy, delicious! And, surprisingly, it paired well with the Mercer Cabernet Sauvignon as well as, the Mercer Chardonnay which were served with it. 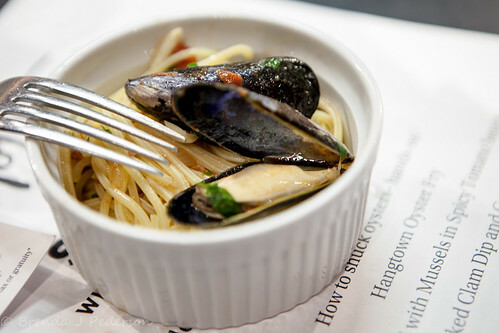 If you’re attending Taste Washington look for this chowder – you’ll love it. As a bonus, this chowder can be made Gluten-free and I believe that’s how they’ll serve it at Taste Washington. They will also be offering their Pesto Salmon, another big winner in my book. I had hoped, however, that they’d choose they Halibut Quesadilla we sampled that night. 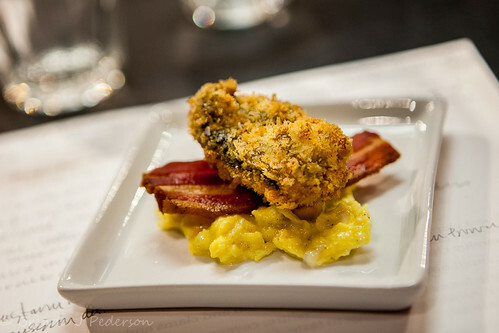 It was different than what is normally served at wine events. Not only was the fish perfectly cooked, a cucumber pico de gallo was a fresh counterpoint to the lightly-blackened fish. Luckily for me the halibut is on Duke’s Happy Hour menu so I can pop in and get it anytime! If you haven’t been to Duke’s for a while get back in there and give them a try. The Duke’s closest to me always seems to have a longish wait and I’ve let that keep me away. But this tasting reminded me why they have long lines. I mentioned the chowder could be made gluten-free, but Duke’s also offers a Gluten-free menu – I know many people who will appreciate this. In addition to the great food we sampled six of the Mercer wines. Again, I enjoyed all of them and am really happy I had the opportunity to taste so many during this event. Two of my favorites were the Reserve Ode to Brothers, a Rhône blend of Grenache, Syrah and Mouvèdre; and Sharp Sisters Red Blend, primarily a fruit-forward Merlot but nicely blended to bring balance and structure. 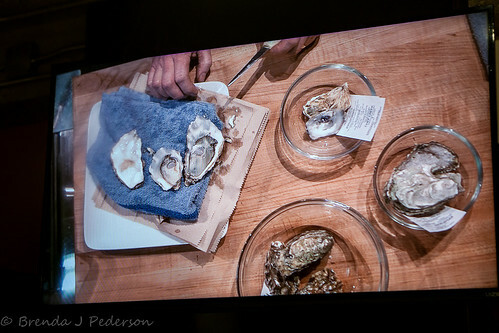 Mercer Estates will also be at Taste Washington. 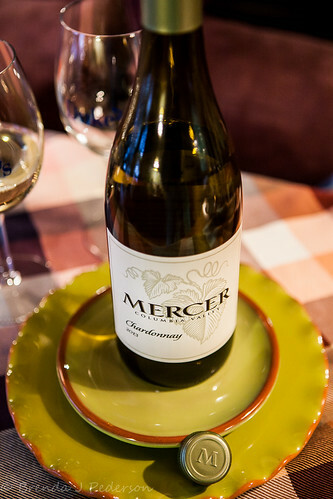 The event can be overwhelming with so many winemakers but keep your eyes open for the Mercer table! As an added bonus both Duke’s and Mercer believe in sustainable and conservation practices, which is great. I love when good taste combines with good stewardship. The chowder recipe and location information are after the jump. The only thing better than catching up with friends is catching with friends over lunch. Yesterday I did just that. Fonda La Catrina was the place. My first time there, although it’s been a Seattle staple for some time. 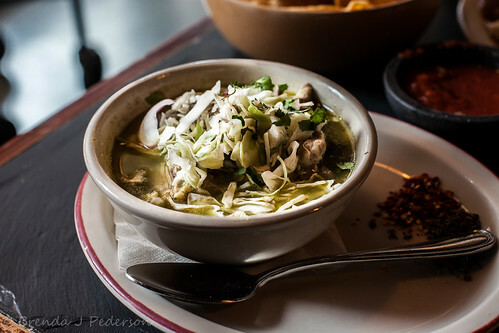 Located in the heart of Georgetown, that industrial neighborhood on the south end of Seattle, Fonda La Catrina provides a warm and lively spot for meeting friends. I’m looking forward to warmer weather and checking out their deck, too. We had the special Posole to start. And really we could have ended there. Even the small bowls with their fragrant broth and tender pork were large enough for a meal. 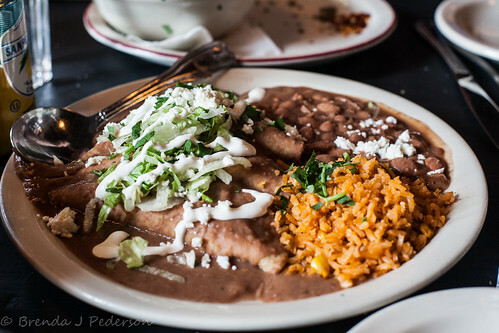 But we’d also ordered Enfrijoladas – tortillas dipped in a bean sauce before being filled and smothered. We chose carne asada for the filling, which was okay but not great. I think, though, that it just wasn’t the best choice for this dish and probably would be good in a taco. The beans and rice that came along with the enfrijoladas were really flavorful. Move over Rooster – there’s a new Sriracha in town! A couple of weeks ago one of the guys behind Fix Hot Sauce asked if I’d like to try a bottle of their sriracha. 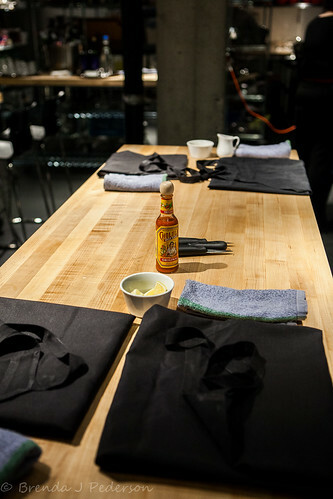 After taking a look at their site, I was interested – a fresh, local sriracha? Intriguing. I don’t know about you, but I’ve never thought about looking for anything other than the rooster. I have a large bottle that’s been hanging out in my fridge – for way longer than I’d like to admit. I’ve taken it for granted, using it as a condiment mainly for soups or Asian dishes and it’s been fine. There’s been no considering that there might be something better. But that’s changed. The sauce arrived, I opened it, poured a little on my finger and tasted it. Wait a minute! This sauce tasted like a food, not just an indiscriminate sauce. It was fresh, flavorful and had a lovely hot, but not searing, bite. 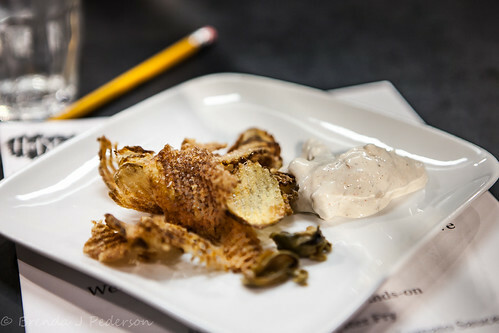 After dipping and drizzling it on a few things I decided to try it in a way that really let the taste of the sauce come through – not just as a condiment but as the star. 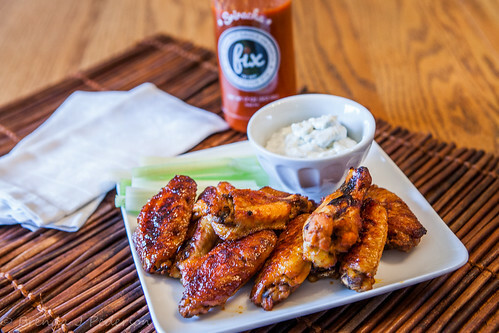 I had a recipe sitting in my “to try” pile that seemed perfect – Slow Cooker Buffalo Wings. I loved the recipe – easy to make, a little more healthy than deep-fried wings, yet close enough to traditional Buffalo Wings to satisfy the craving. And they were delicious made with the fix Hot Sauce. Fresh and spicy! Tender and juicy. As messy and finger-licking good as any hot wing should be. I believe fix is only available through their website. They are currently offering a 25% discount before they officially launch. You can order fix here. Add the chicken and sauce to the slow cooker. Toss to coat all wings. Place bits of butter on top of the wings. Cook on HIGH for 2-2.5 hours. Keep the lid closed to retain the heat. I opened once to turn the wings over and make sure they were all still covered in sauce. When cooked, take the wings out of the slow cooker, leaving the sauce in the slow cooker, and put the wings on a baking sheet. Broil the wings in the oven for a few minutes on each side until browned and crisp. Place the wings on your serving dish along with celery, carrots and a bowl of dressing. Drizzle or brush some of the leftover sauce from the slow cooker over the wings making them as messy as you’d like! A few years ago, friends gifted me with a loaf of Pan d’Oro from Breadfarm. 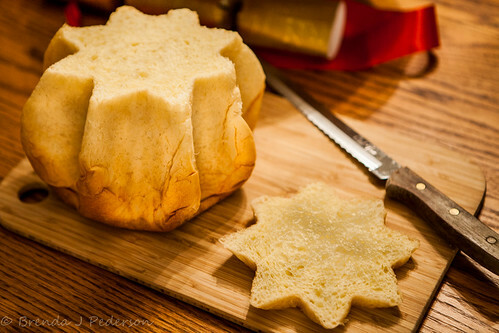 I wasn’t familiar with Pan d’Oro, also called Pandoro, but knew it’s cousin, Panettone very well. While there are some similarities, Pan d’Oro is a plain dough. It is golden-colored due to the high number of egg yolks in the dough (Pan d’Oro means golden bread), is and flavored with lemon zest or vanilla or some combination of the two, according to the recipes I found. The Breadfarm’s version uses vanilla. I was in love from the first bite. 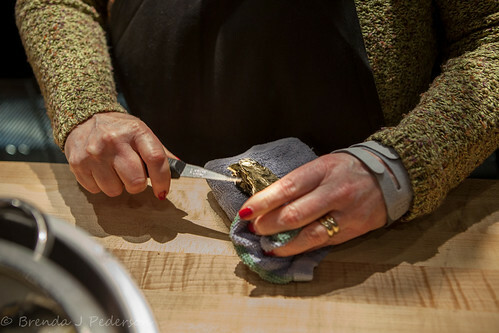 There are various recipes for Pan d’Oro: Mario Batali has one that is pretty straightforward; but there are others that are much more complex. 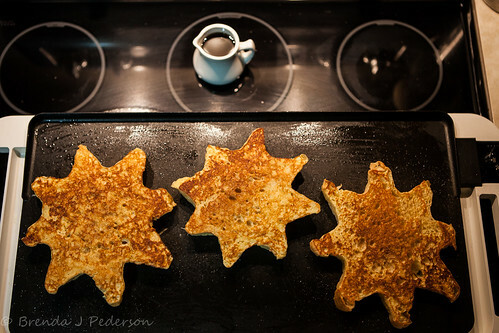 The bread is baked in a special 8-pointed star pan. The final product has a texture that is a cross between bread and a light cake. When served you slice across the loaf to reveal the star. It’s often served as a dessert with Chantilly cream, whipped Mascarpone, or drizzled with a thin powdered sugar glaze. 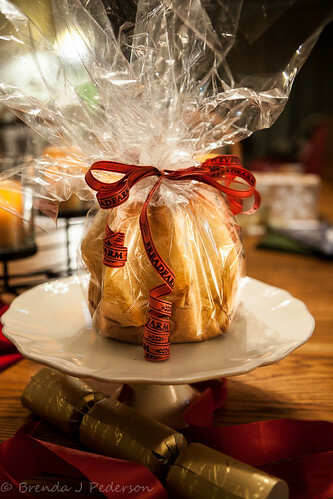 Just before Christmas I was in Bow, next door to Edison, home of The Breadfarm, so couldn’t resist purchasing a loaf. In fact, I bought two, one for my sister who was hosting the family celebration this year and one for me, along with a few other Breadfarm treats. If you haven’t been to this bakery make an effort to check it out sometime. Warning: they only accept cash and checks for payment so be prepared as you’ll want to load up once you see all they have to offer. On Christmas morning I used my Pan d’Oro to make French toast. I loved the golden stars and the final product was a delicious, fragrant, rich breakfast. While the slices cooked I sprinkled cinnamon-sugar over them and then served them with warmed maple syrup and a side of thick-cut bacon – what a great holiday breakfast! 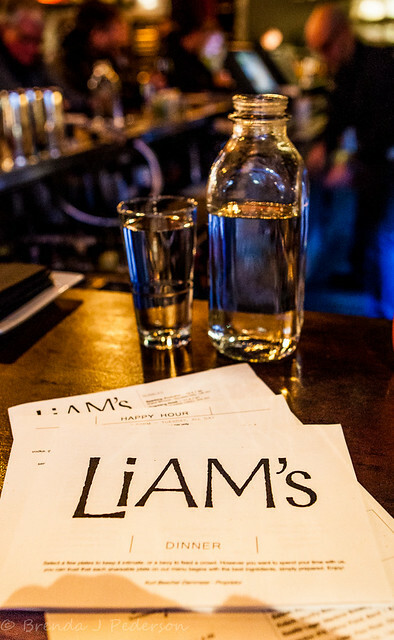 I could have titled this First Look, since this was my first stop at the newish Liam’s at University Village. But my quick visit for a glass of wine and an appetizer doesn’t qualify as a true First Look. I stopped by late afternoon on a very cold Saturday. I was expecting to walk into warmth but the place was actually on the chilly side. The bar was pretty full – most seats along the bar were filled, as were all the tables in the bar area. I chose one of the open seats at the bar and was soon greeted by the bartender with a bottle of water (I love that so many places do this now) and three menus: beverage, dining, and Happy Hour. 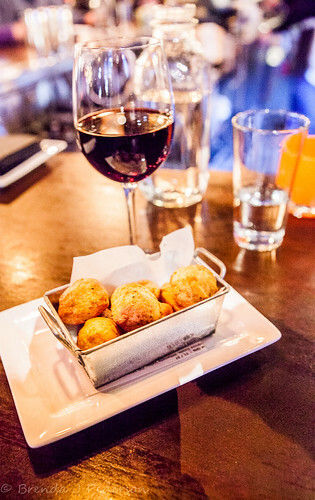 The Happy Hour menu has a nice selection of options with a few beverage and food choices. Looking for a little nibble to accompany a glass of Happy Hour Red (a Cabernet) my eye landed on Marco Polo Gougerè, described as flavored with mixed peppercorns and smoked salt. 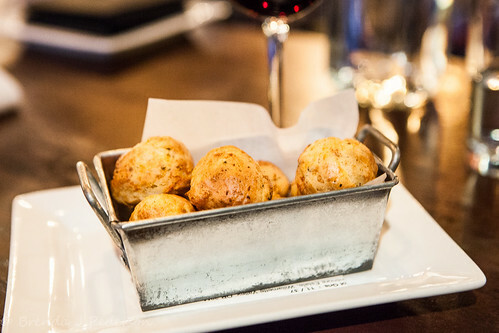 I am a huge fan of gougère and never pass up an opportunity to try them, even though I prefer mine to most I’ve found in Seattle restaurants. And, even when done not-quite-right, they are a perfect light bite with wine. I placed my order and waited to see what would come from the kitchen. They arrived. Great presentation, perfect small size (they are made anywhere from fist-sized to golf ball-sized) and perfectly golden. I was almost afraid to bite into them but there was no need for fear! Still hot from the oven, crispy exterior and airy interior, they were delicious! The salt and pepper combo was really good – a little spicy but not overly so. Maybe even better than mine. Maybe. Can’t speak to anything else on the menu but the gougère are worth a visit. Overall the prices here seem a little high to me so Happy Hour is a nice opportunity to try a few things from the menu. I also hope they get the inside temperature figured out. It really was on the chilly side, not pleasant for lingering. It’s taken me a long time to write about this place, which is a shame, because I love it and think you should, too! 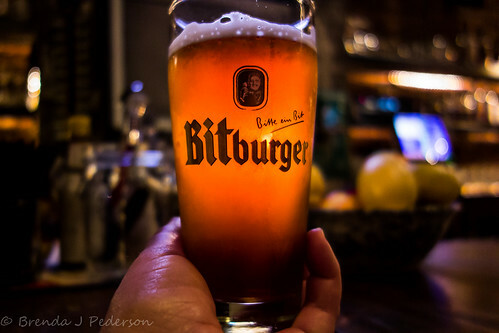 But after all the times been to Altstadt I only have beer photos to show for it. So I’m giving up on getting a good food photo to post and am going to share a couple of beer photos. This is a great place and although it’s often busy, I feel it’s still relatively unknown. 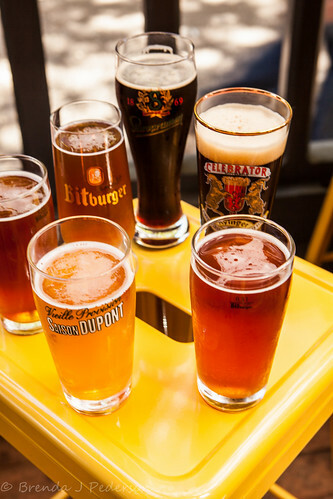 As you may have gathered from the name, Altstadt is all about German food and beer. They have a dozen beers on tap (mostly German) and another 20 or so available bottled or canned. There’s wine and a full bar, too, but I’ve been working on sampling all the beer on tap. Something great for those of us who don’t drink tons of beer, they offer a .3 liter size. For those of you who know what you like you can also choose ½ or 1 liter options. In fact, they seem to offer a 2 liter “boot of beer”. I don’t know the details but I’m sure you can figure it out if you’re interested. The food is delicious. Hearty, tasty, traditional, with maybe a little twist. Everything is made in-house, even the mustard! The sausages are perfectly grilled; the sauerkraut has turned me into a cabbage lover; the spätzle (order it with the bacon!) is prepared like a delicious mac’ and cheese. One of my favorites is the leberwurst, served with dark bread and a selection of mustard. A great deal for $5, too! You’ll fine Altstadt in Pioneer Square but it’s an easy walk from the Pike Place Market area or downtown. Do yourself a favor and check it out sometime soon. This was barely even a first look – a friend and I popped in for a short but sweet, happy hour a few days before they’d even had their grand opening. But I’m anxious to go back and give the place a better once over. 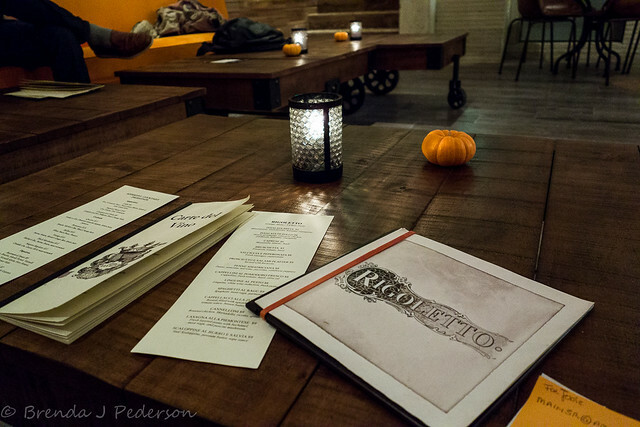 Rigolotto is located at the base of the new Stack House apartments. The entry is off the courtyard on the back side of the building. Look for the sign on the sidewalk directing you to the entry. It’s a huge place! We made our way down the stairs into a cozy seating area, which is the bar. 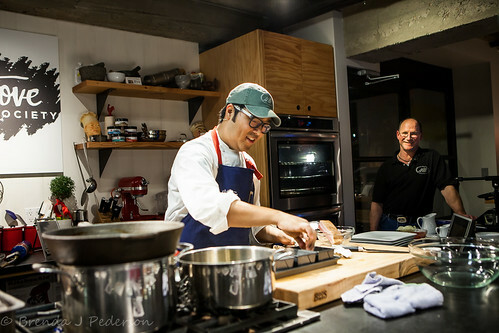 Across the room, in the open kitchen, you can see the chefs and cooks busily working. The kitchen is a large L-shaped space. I was surprised there was no counter seating along the space – seems like a missed opportunity. There is, however, a large communal table in the same area. When I arrived there were a few people with laptops seated there but I couldn’t tell if they were employees or customers. It would be a nice workspace for mobile workers but I don’t think that’s the intent. But on to the important stuff – the food and drink! 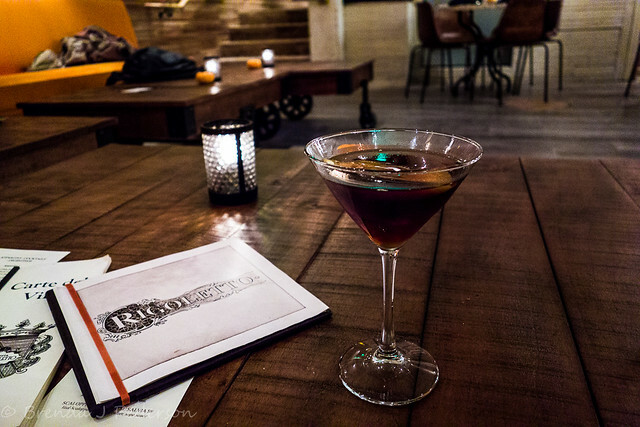 I started with a Black Manhattan – a very delicious cocktail. My friend had the house prosecco, which we both thought was a little on the sweet side. 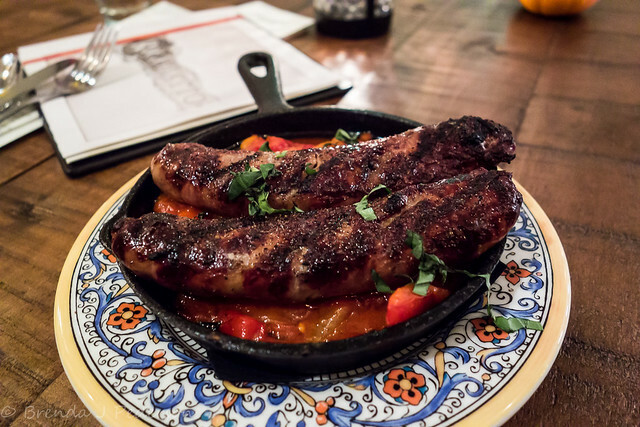 We ordered two things from the bar menu, house-made sausages with peppers, and a stuffed pasta. The sausages were perhaps the best sausages I’ve ever had. And that is saying a lot! A really delicious combination of meats and spices, grilled until crispy on the outside but still juicy on the inside. The roasted peppers served alongside were also prepared perfectly. I thought the pasta had good flavor but was a little under-cooked. I like pasta that’s al dente, but this was a little gummy. There’s promise there, though, so I’m not writing them off at this early date. In fact, I’d go back just for the sausages! 451 Avenue Yale Ave N.
A favorite weekend activity is to walk on the Bainbridge Island ferry; walk the few short blocks up to Winslow center; take a stroll through BIMA; wander through the shops on main street; then stop by Hitchcock Deli for lunch. I was thrilled when I heard another Hitchcock would be opening in Seattle’s Georgetown neighborhood. Well, it’s open! I was running errands in the area today so I stopped in and picked up a sandwich to go. This location has a few more indoor seats than the original, and there’s outdoor seating in good weather. Still, I’m guessing that take-out will be the way to go, many days. 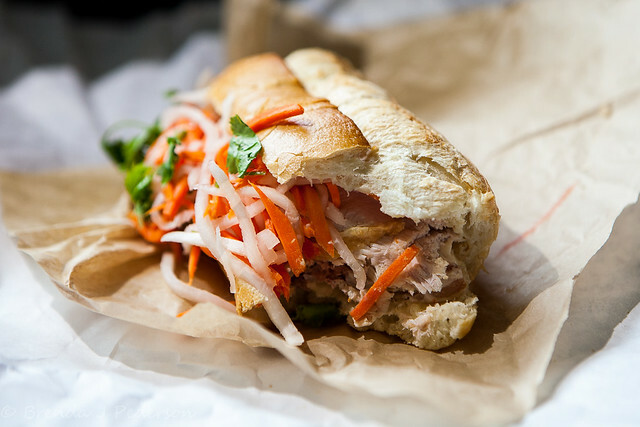 Today, I picked up their version of Bahn Mi. For the most part it’s fairly traditional, but they sneak in a little pate. I’m not complaining. 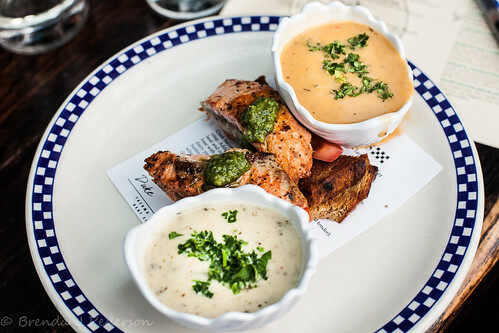 Besides sandwiches, daily soup, and a few salad or veggie sides they have charcuterie take-out.